The reviews are in, and they’re glowing! Plus it was named one of the top 7 books for content marketing success by the Content Marketing Institute. Many thanks to all those who showered this title with praise via e-mail, LinkedIn, Facebook, and Amazon… where the book has received close to 50 5-star reviews. And here’s exactly what some B2B copywriters and marketing experts are saying about it. Gordon has a booming practice working in the trenches with companies on their white papers. So he knows, first hand, how to plan them… how to write them… and how to market them. I can think of no one else I would recommend more to guide you in creating a white paper that works. A must-read book if you’re considering writing white papers—and an invaluable resource if you’ve been writing white papers for years… from one of the most experienced white paper writers in the business. White Papers For Dummies is a “must-read” for anyone interested in the subject. Gordon Graham’s book contains priceless information you just can’t find anyplace else. If you ever have to write a white paper or supervise the creation of one, have this one-of-a-kind book by your side! I haven’t read the whole book yet, but I spent a good hour dipping into it, and it’s terrific. I don’t think anyone has done the thinking and analysis of what makes a great white paper that you have! I’ve written plenty of white papers in my copywriting career, but Gordon’s White Papers for Dummies is a real treasure! I especially like the section on promotion, because it helps copywriters add strategy to their service offerings, making them more valuable and the project more successful. If your business wants to produce a white paper, don’t start until you read White Paper for Dummies. If you’re a freelance writer who wants to offer white paper writing to clients, don’t start pitching your services until you read White Paper for Dummies. And if you’re in business and don’t know what the heck a white paper is, read White Paper for Dummies. When it comes to white papers, this book is gold. White Papers For Dummies is the most comprehensive guide to writing white papers that I have ever seen. Not only does it fully describe how to write the three major types of white papers, it also provides ample advice on how to promote your white papers to reach a larger audience and increase your marketing ROI. I highly recommend this book to anyone who writes white papers—whether this is a new area for you, or you have been writing white papers for years but want to improve them and achieve better results. Over the course of my career I’ve written dozens of white papers, particularly for technology companies. In typical For Dummies fashion, the book points out helpful tips, not-to-be-missed points, interesting stories and “danger” zones. As a writer, I can say without hesitation that my fellow scribes would find this book invaluable, especially if they can write well but don’t yet have a lot of experience with white papers. White Papers for Dummies will increase their confidence by 100%. And, if you’re a B2B marketer who’s not using white papers, why not? I bought White Papers For Dummies and I’m learning something new every other paragraph. I have stickies and highlights and all kinds of pen notations, which is always the sign of a good reference book. Thanks for a great, informative book that gives me new avenues to explore in this crazy writing career. This is absolutely the finest book on the subject to be found anywhere. If you’re a B2B writer and you follow the guidelines in this book from start to finish, it can catapult a career for you as a writer of white papers. This could easily be a dry subject, but Graham spices it up just enough to hold your interest. What I like in particular is his candor when it comes to discussing the chances of relying on white paper writing to earn a living. He says it’s very difficult… but he also lays out several scenarios—realistic ones—that make it feasible. All in all, this book is chock full of information covering everything from A to Z, and it’s an easy read. If you’re interested in writing white papers or just want to learn more about how white papers can affect your marketing mix, I would highly recommend this book. The most valuable new information I learned was his checklist of “must” and “could do” promotions. Like he says, why spend so much effort to produce a persuasive white paper and then not get it out there to generate leads? Congratulations on a terrific book that will help beginners and advanced white paper writers alike. Gordon Graham’s White Papers for Dummies is a well-organized, excellent reference guide for writers looking to expand the services they offer to B2B clients. Graham has an established track record crafting hundreds of white papers… but his expertise is delivered in a friendly and approachable voice, as he outlines strategies for success for the beginner and seasoned expert alike. The book covers everything you ever wanted to know about white papers, from how to structure the document, price projects, manage client-writer communications, and avoid common pitfalls. I’ve read books on how to write white papers in the past. This is the best. Gordon Graham cuts through the fluff and gets right to the heart of what you need to know and the process you need to go through to get a good white paper written. The first question he answers is “What kind of white paper do you need?” That’s the all-important question most marketing managers can’t answer. But it’s crucial to getting the right marketing piece written to the right audience at the right point in the sales cycle. Overall, I found it to be a very easy read with a lot of sensible tips and tricks that anyone can implement on their next white paper. Highly recommended. I write white papers and marketing collateral for technology companies. The content here is so valuable (to me, professionally) I’m a little embarrassed how little I paid for it. It’s not only about writing—the sections on promoting white papers, and on finding clients, are a welcome bonus. Unlike so many in the Dummies series, this is a very, very good book. In my other life as marketer and copywriter, I’ve sought information about writing white papers. I’d acquired some hard cover books written by an alleged expert. This book was better in every way, exceeding my expectations many times over. Graham gets right to the point. He explains who reads white papers and why; I’ve never seen such a clear discussion of white papers vs case studies vs other types of writing. He identifies three “flavors” of white papers, using an analogy that’s memorable but not overly cute. He goes through the outline of white papers, section by section. Graham’s formula works for many kinds of writing: Think like a lawyer, write like a journalist and promote like a madman. The section on promotion seems especially strong. This book turned out to be excellent in every way… a standout in the series and the current catalog of business books. I’ve written white papers for years and yet I learned a lot from this book. Highly recommend it to beginners and long-time writers. It’s now a permanent book on my resource shelf. Concise, well-written and done by a true consummate professional. If you’re in the market for hiring a white paper writer, considering tackling the job yourself, or just looking for a lucrative career, this book will move you toward your goals. Graham is the man, you won’t go wrong here. I just used this book to help me write a white paper for the trucking industry… it’s full of nuggets of wisdom and I highly recommend it. A footnote: if you need a really good white paper, head over to Graham’s website and hire him… if you can! The author was thorough, both in covering the basics of designing and writing a white paper, and in identifying pitfalls and common mistakes. As I move forward with the white-paper project which led me to buy this book, I’ll certainly refer back to this book multiple times. Gordon has an easy flow about his writing; and does a masterful job of breaking down concepts to where they are easy to understand, digest, and execute. I found this informative and an invaluable resource, whether you are new to white papers, or are a seasoned pro looking for fresh ideas to streamline your writing process. I wish I had this book when I started my career as a technology marketer! 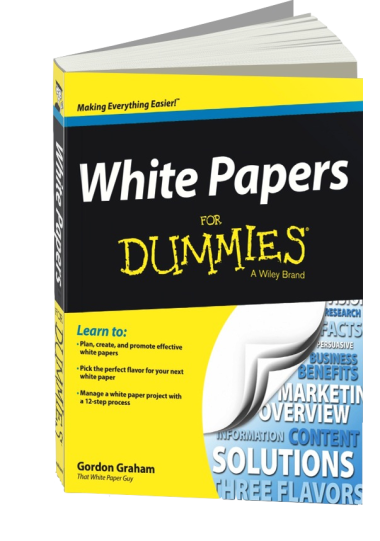 White Papers for Dummies is packed full of practical information about how to plan, execute and promote a white paper. Useful tricks of the trade are sprinkled generously throughout… I especially liked the section on how to promote your white paper once it’s done. Buy a copy for yourself, and give one to your VP of Sales & Marketing! White Papers for Dummies is a great introduction to the world of writing white papers. Before this book, I had heard the term, but did not really grasp what it meant. Writing an effective white paper can be tricky, but Graham… goes over the issues that can make it a stand out showpiece as opposed to a mediocre, boring, sales pitch. Though I am just starting at being a commercial freelance writer, this was just the book I needed to get a better idea how the process is done. I would highly recommend it for anyone faced with writing a white paper for the first time or even after having a few of them under their belt. This book is longer and more recently published than the Stelzner book which has been the standard text for writing white papers. It is also cheaper and broader in scope, covering not only how to write and promote white papers, but also providing guidance for managers hiring talent for white paper projects. I recently took on a white paper project for a digital marketing firm, and this book saved my life. It goes into wonderful detail on how to select the right kind of white paper, outline the white paper, research, format, work on a team to produce the white paper, etc. This book is my white paper writing bible. It’s also very engaging and easy to read. I have the Kindle version, and it’s wonderfully optimized for its format, with tons of in-text hyperlinks to different parts of the book for easy reference. If you need help writing a white paper, this is the only book you need. I’m so grateful it exists, I actually wrote a review. White Papers for Dummies takes the story further in several ways. I especially liked the author’s analysis of three types of white papers, which he refers to as Vanilla, Strawberry, and Chocolate. Using this basic 3-part characterization permits him to go deep into the whens, hows, and whys of using different flavors of white papers for different purposes. Freelancers and newcomers to white papers are likely to appreciate his description of the white paper procurement process, and the steps involved in working with the numerous individuals likely to be involved in creating white papers for corporate clients. I’ve been on several webinars where Gordon has presented, so I was primed to expect a lot of practical, carefully-organized details. When I received a review copy, I was pleased to find more than I expected in a highly readable format. No other B2B marketing piece can do more to generate leads, nurture prospects, and build mindshare. Where white papers were once used only by technology firms, they are becoming “must-have” items in the marketing toolkit for almost any B2B firm. Practically every startup must produce a white paper as part of its business planning. But writing effective white papers is a big challenge. Now you can benefit from the experience of a white paper specialist who’s worked on more than 273 white papers for clients from Silicon Valley to Finland, from tiny startups to giant firms like Rackspace and Google. Author Gordon Graham—also known as That White Paper Guy—provides dozens of tips and tricks to help your project come together faster and easier. White Papers For Dummies gives you a wealth of practical, hands-on advice from one of the world’s leading experts in the field. 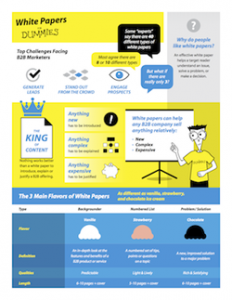 White Papers For Dummies strives to clearly explain the theory and practice of using white papers in B2B content marketing. This book is organized to make everything easy to find and simple to apply. It starts with an overview of the power of white papers and the huge opportunity they present to both marketers and copywriters. You won’t find this kind of detailed treatment of white papers in any other book on the market. I know, I’ve read them all. 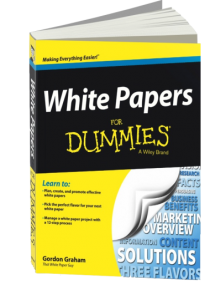 And whether you’re just getting started with white papers or you’ve already created several, White Papers For Dummies has something for you. If you’re a marketing manager, this book sketches in the benefits that white papers can deliver to your company, and shows how to choose the best format to meet any challenge at any point in the sales funnel. If you’re a writer, this book is packed with tips on how to plan, research, write and design a compelling document that stands head-and-shoulders above most other white papers out there today. No Dummies book is complete without a cheatsheet. The cheatsheet for my book covers the three main types of white papers, six simple ways to improve the look of any white paper, and 15 must-do tactics for promoting a white paper. And that’s not all. Even though this book is 384 pages long, we just couldn’t squeeze everything in. But you can find it online. Looking for ways to make your white papers more engaging? Think about introducing rich media like animation, audio, video or interactivity. Could you use help researching your white papers? Here’s some tips on working smoothly with a researcher. And finally, every writer needs to safeguard our work, right? But not everyone remembers to back up their files. Here’s an article that sums up four ways to manage your documents and avoid losing anything. Plus, there’s a unique 4-page infographic you can use as a quick-reference when planning and writing your next white paper. Just click on the image just below this article to get it. And here’s a 4-page PDF that sums up the basics of the three flavors of white papers, complete with a suggested table of contents for each flavor.